Ah, fall. Starbucks starts selling their presumably popular Pumpkin Spice Lattes (Do those have coffee in them? I’ve never drunk one, and I can’t tell. ), I start break out the sweater-leggings (best invention ever), and television goes absolutely bonkers with new shows. That’s right. Pilot season. It’s baaaaack. For those of you who are relatively new to my blog, every year I make a valiant attempt to watch all the new shows that come out in fall. I mean, I make a pretty decent attempt the rest of the year too, but fall is special. It’s when the network shows come out, the ones that everyone can watch, and plus, it’s fun. In a mildly psychotic, intensely exhausting kind of way. Still, this year, for once, the offerings look pretty good. And rather aggressively terrible too, but we’re going to start with the good. 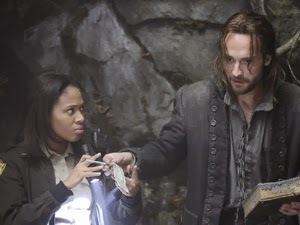 Let’s talk about Sleepy Hollow. Now, I will cop to this, I was not optimistic about this show when I first heard the pitch. Ichabod Crane time travels to the present day to fight the evil headless horseman? And it’s a procedural drama? It sounds like a fake show pitch from 30 Rock. But, as it turns out, it isn’t fake, and it isn’t terrible. It’s actually, brace yourselves, really good. Ichabod Crane (Tom Mison) is a soldier in the Revolutionary War when he fights a terrifying British soldier who seemingly cannot die. When shooting the man repeatedly doesn’t work, Ichabod cuts off his head, only to fall comatose moments later from his own wounds. He wakes up two-hundred and fifty years later in a cave, and stumbles out to find his world transformed. The republic he was fighting for is no longer new and shining, but old and established and a bit tarnished. Abolition has finally come about. Women wear trousers. And that British soldier he killed is apparently murdering perfectly nice police sheriffs. 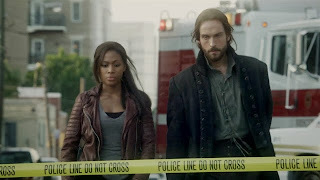 Ichabod runs smack into Abby Mills (Nicole Beharie), former deputy to the murdered sheriff. Abby, who plans to transfer to Quantico and the FBI at the end of the week, is horribly shaken up by the death of her mentor. But she’s also not stupid. She knows something was deeply weird about his death, and when Ichabod shows up and can describe the (headless) killer, she decides to throw reason to the wind and take up with him. For justice. What follows is a rather standard, but no less good for being so, episode, where Abby and Ichabod try to find the Headless Horseman’s head before he does, and in so doing attempt to postpone the apocalypse. It seems that said Horseman is actually Death himself, from Revelation, and Abby and Ichabod are the two Witnesses destined to stop the Four Hoursemen and save humanity. Oh, and John Cho shows up as a police officer with a crush on Abby, and is both adorable and sinister when you figure out what he’s really up to. So let’s get the easy stuff out of the way first. The show’s good, you should watch it, and you’ll thank me later. It’s funny, managing to show the “man out of time” scenes with more wit than usually expected, and no boring tropes about his bewilderment at modern life. Mostly, Ichabod is absolutely pissed to be ripped from his time, and frustrated that everyone thinks he’s crazy. Which makes sense, really. Though he does have a fascination with car windows that is really entertaining. Still, for all that it’s his face on the posters, Ichabod Crane really isn’t the main character of this show. That honor goes to Abby. It’s her story we follow, her emotional development we watch, and her decisions that keep us on the edge of our seats. She’s the hero here. Ichabod is just the vehicle to get her in the story. Stop and think about that for a second. The attractive white man is the vehicle to get the black woman into the narrative. Take a second, then do a happy dance with me. I don’t have to tell you how rare it is to see a story like that, but I will tell you that it makes this particular story a lot better. Why? Well, simple. Abby is a really interesting character. Ichabod might be interesting too, but Abby? She’s pretty unique. When she and her sister were young, they saw something in the woods. Something terrible. Not sure whether it was a demon or a hallucination, or even a surreal understanding of some kind of drastic sexual abuse, Abby and her sister were called crazy. A lot. They both went off the rails. Her sister turned to psychiatric institutions, Abby turned to the streets. Eventually, the sheriff arrested her and convinced her to try straightening her life out. Joining law enforcement. Making something of herself. And she did. But as we go through the story, we discover that he didn’t do this just out of the goodness of his heart. He did it because he remembered her story, about the demon in the woods and the four white trees, and he knew she was special. He knew she had seen something. And he knew she had to be ready for what came next. The point of this isn’t that Abby has a hard backstory. Those are a dime a dozen. The point is that she is special. She’s not just some normal woman who wants to help. Abby is important. She’s destined. She is, in fact, the Chosen One. Well, half of the Chosen Two, to be more accurate. She isn’t the sidekick. She isn’t the help-mate. Abby is just as much a hero in this story as Ichabod is, and for the moment, at least, she’s the one we identify with. That’s pretty radical. There are lots of little things in the show that just make me happy, for the record. Like the fact that Abby isn’t the only character of color we see – we actually see quite a few. Or that she is completely open about dealing with racial and sexual discrimination. She gives Ichabod some well-deserved crap when he slips into condescension. Or there’s the bit towards the climax of the episode where John Cho’s character tries to sideline Abby to keep her “safe”, and she pistol whips him, handcuffs him to his own car, and staggers back into the fight. Abby is strong, she’s interesting, and she’s determined. But she’s not perfect, which is, in a way, more perfect. She’s a character with flaws, like her tendency to take offense too easily, and her impatience, that kind of stuff. She’s still human, which just makes her better as a character. Abby is the kind of woman you really want to see more of, and she’s the kind of character that you can totally imagine sticking around for seven years. Plus there’s the thing where Ichabod and Abby are totally going to end up together, which is just fine with me. Interracial, time-traveling romance between two mythic defenders of the Earth? Bring it the hell on. Of all of this, though, the really important thing is this: Watch the damn show. No, I’m seriously. Watch it. Even if monsters and the apocalypse aren’t really your thing. Even if it all sounds silly. Even if you don’t like it. That’s fine. Just turn it on mute. Because I refuse to let this be a show that gets cancelled for low ratings. I refuse to let this be a show with a strong female character of color lead that gets cancelled because no one actually watched it. I refuse to let this opportunity go to waste. So. Watch it. Or else. 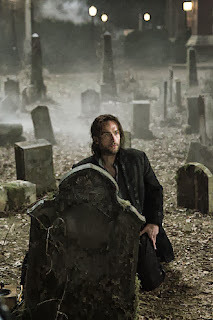 Sleepy Hollow airs on NBC on Mondays at 9pm. I agree with the part in the article about the Sheriff "fathering" her. That was just silly. I can see the author's point that it's a racist stereotype (and "absent/neglectful" parents are an overused trope in Urban Fantasy all around). I also don't think that Abbie has enough control of the situation all together. Ichabod kind of annoys me, haha. But I'm giving it a chance. I think that article makes quite a few good points, like the absent parenting thing, and how it's all just a bit too easy, but I honestly love the fact that the show is following Abbie's emotional arc more closely. By focusing on her emotional progression, it makes her the central hero. We care about how she in particular will be transformed, and how she will grow as a person. Meanwhile, Ichabod is stuck as a rather staid character. He's not set up for any big change. And this means that Abbie, the black, lower-class woman, is the hero on our big budget urban fantasy show and this brings me deep joy.